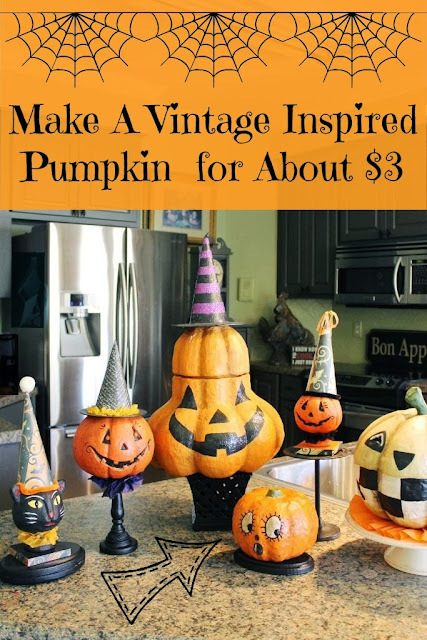 Halloween items and even attempted a DIY vintage pumpkin. This year the little collection found itself in the kitchen. were purchased from a floral wholesaler's tent sale. from items from the Dollar Tree. The $3 pumpkin got her start almost accidentally. head doesn't fit onto the bottom very well. broken areas and came across "paper clay". to try to fix the broken areas. the texture was similar to the surrounding areas. It also took acrylic paint well. vintage items so I would just copy HL. put a little glue on top of the "spit ball" and rub it in. pulling up non-dried areas with your sticky fingers. dry and starting again. Each session was quick. dried mix bump up against each other. different and not like the real vintage pieces. mache' and has dried, it is ready to paint. but an inexpensive acrylic paint from the craft store. same results...truth in crafting costs. that you have some of that on hand already. give it a little variation but you would not have to do that. more red or yellow into the orange to make it different. find a vintage pumpkin face that you like better. toilet paper surface so I experimented on the bottom. The paint did not run or bleed. Maybe the glue seals it. ...Tom Kat thinks that she looks like Betty Boop. brushed on top of the dry paint. him blend in color-wise a little better with the other items. noticed that a lot of them have ruffles at the neck. pumpkin got a ruffle made from 3" strips of paper napkins. than to try to attach it to him. 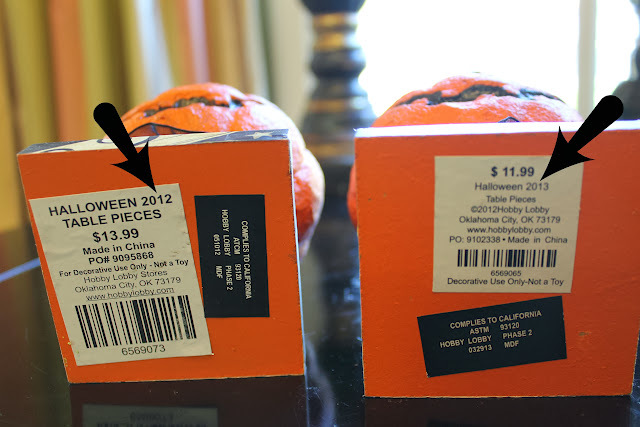 discount at the after Halloween sale at Hobby Lobby. them again (forgetting about the ones sitting in the attic). I found the ones purchased last year too. This year's are exactly like last year's but even cheaper. areas on the large orange pumpkin. For right now, good enough is good enough. His head still does not fit together very well. These guys are just like they are when they came from HL. plaques from the craft store painted black and stacked. and the counter...maybe no one will notice the twins. a couple of years ago in "Pick A Peck of Pumpkins". yard for a few Halloweens. They also got new stems. on "Make Fake Vines and Stems". Another vintage vignette by the refrigerator is tiny. cards with tiny clothespins on the back from World Market. for now they are clipped onto votive candle holders. ...I hope her buns don't CATCH fire on the candle. I don't have them lit unless I am in the room. This little guy came from Dollar Tree. the body of a human but the head of a pumpkin. I enhanced his colors a little bit with acrylic paint. Thanks for taking a Halloween tour of my kitchen décor! I love all those vintage looking pieces, they are my favorite too. and she does look like betty boop! They are so cute and you are always so creative. I love your collection of pumpkins...so cute!! Love the way you displayed the little ones on the candlesticks!